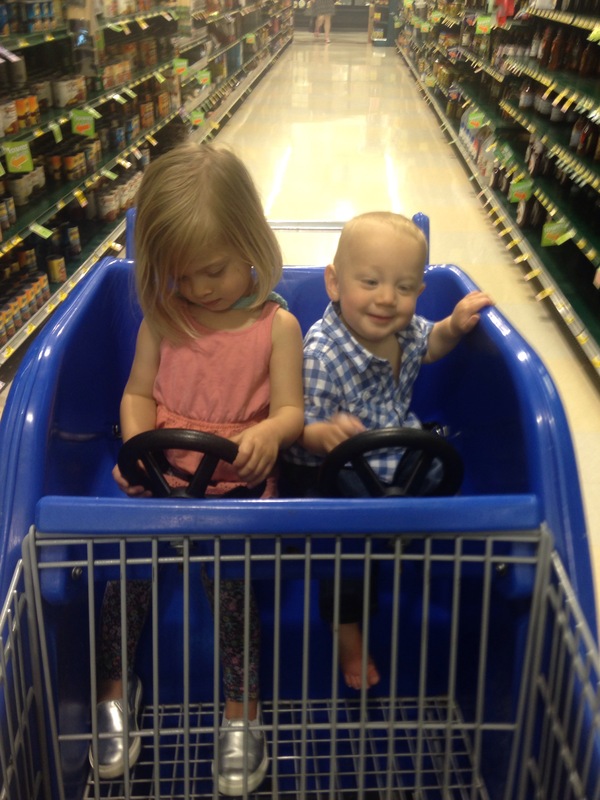 I’m pretty darn sure that since Jack has been born, I’ve been to the grocery store by myself with the kids a total of six times. It might even be five. Actually I think it is five. That in and of itself is pretty epic. Until you then consider that three of those times have been this week. And it’s only Wednesday. I’m truly just blowing myself away. And today, for the first time, I tackled Charlottesville with them. Don’t be too impressed people. First, to Trader Joes where it is way to easy to spend way too much time browsing the aisles wondering if there’s anything else cool you need. I then managed to make it to Jack’s doctor appointment only 5 minutes late. He had to get two shots and Ev cried more than he did. At this time it was a little after four and I knew Wesley was doing his cross country flight tonight so I decided I’d better treat myself to Starbucks. After all, I’d made TWO stops in town with TWO kids. We went in, Jack on the hip, Ev jabbering about chocolate, and I opened my mouth to make my order. ‘Whoa,’ said the guy behind the counter. ‘Is that your brother and sister or your kids?’. I had to stop a moment to think. Was this a compliment? He couldn’t decide if I was the cool older sister or the harried young mother? Oh, definitely taking this as a compliment. I laughed and told him they were my kids. (And felt a burst of pride). I had to stop to think again. Was this a compliment? Are you supposed to say thank you? So I laughed again and told him I’d take an iced caramel macchiato. After a nice break on the patio where Ev asked for my coffee approximately 27 times, we ventured to Harris Teeter to get a few remaining items. And for the first time ever, we snagged the cart with the two driver seats which pretty much made everyone’s day. I floated around corners (major drag time) and made cool honking noises. And then I asked this 19 year old Harrist Teeter guy to come with me to my car since I was parked way far away in the Starbucks parking lot. I almost got hysterical as I maneuvered this boat of a cart (like 12 feet) through sidewalks, down ramps, getting stuck on curbs, “um can you lift the front?”, and the guy never even broke into a smile and as Jack went launching into Ev and I launched into laughter. Ah, where was my appreciative audience when I needed it? So yes. Go me conquering kids and town. I’m a true hero. I hope you’re all inspired. Plus. We got to play outside today. This entry was posted in Life as it Happens. Bookmark the permalink. 9 Responses to a record breaking week. I just love this….so happy I get to see them next week!! first of all, i need another play date with you and the chillins. I mean one where I’m actually present. And maybe one where my daughter isn’t grumpy. Second, just the word second is scaring me. second child i mean. How ever will I manage the shopping with two. I’m dismayed. But thankful to hear your success story cuz I’m just not feeling very good about it all. I’m also not the one month shopper type. i go to the store about every other day. Guess that will have to change. 😂😂😂 oh Kels. I love your blog! I meant, by myself with NO kids!! Haha! I’d like to just squeeze Jack.